New Dunesteef Story: Check out this promo! Not too long ago Bryan Lincoln of the Fullcast Podcast asked me to do some lines for a Dunesteef story he was producing called "Plague Birds", by Jason Sanford. It's now live at The Dunesteef Audio Fiction Magazine, and wow, what a cool story. The production was amazing. I was really impressed. And the vomit discussion afterwards, was hilarious (albeit, kind of gross) but my favorite part of the after-story commentary was Abbie giving Rish dating advice! 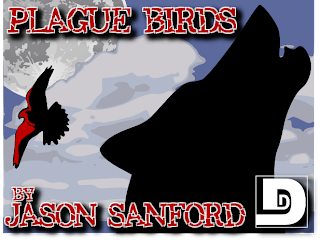 Here's the Plague Birds promo. Check it out!